As I walk around my house, sometimes I have a moment where my brain flashes a bunch of ideas at once of what I can do to enhance a space. I think that’s the design lover in me. And probably why I am constantly moving things around in our home. Since we replaced the flooring, doors, trim, etc. in our home, our hallway changed dramatically. I never really paid any attention to the END of the hallway, until now. Friends, this project literally cost me $16.80. Here’s what the hallway looked like before any renovations. After the flooring, trim, doors, etc. were replaced, here’s a shot of the hallway at Christmas time. Better, but it was missing something. Also, see that pretty gold/glass heavy thing? It’s definitely not baby safe. 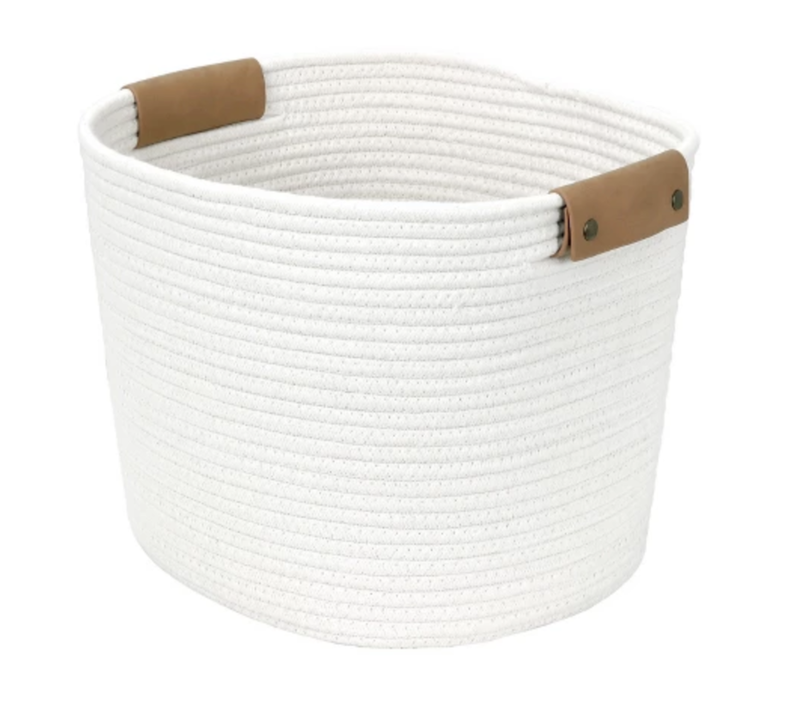 Since our daughter is now mobile, it was time to be sure our home is baby friendly! Here’s where my $16.80 idea comes in. 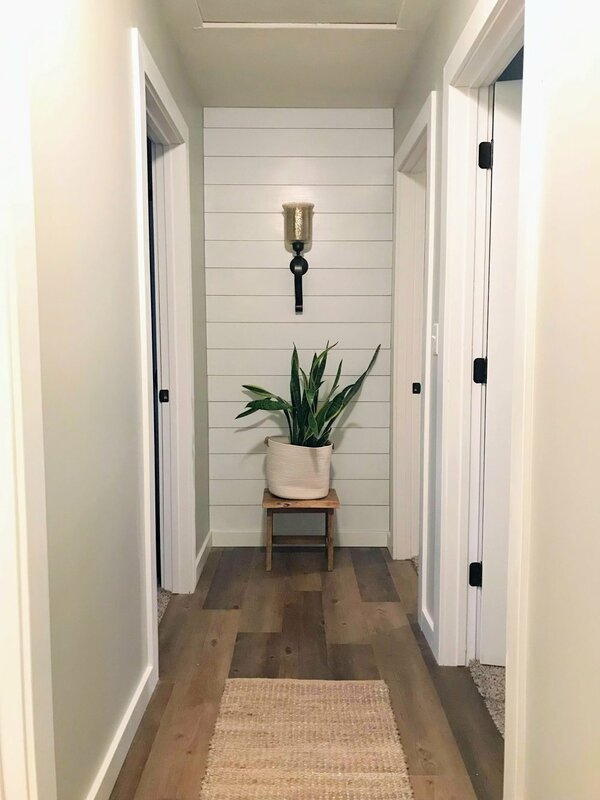 Add shiplap to the end of the hallway to add some character. 1 sheet of plywood - I bought one from Lowes (1/4 inch) and it came to $16.80 with tax. First, I went to Lowe’s and picked out a sheet of 1/4 inch plywood. So I could get it home, I asked a worker to cut it into 4 pieces (12 inches each). Once I got it home, I was able to prime and paint the 4 strips. Once that was dry, I ran it through the table saw to get 8 strips at about 5 3/4 inches. Once the 8 strips were cut, I then used the miter saw and cut them all to size to fit on my wall. The best way to get them all the same size is to cut one at the exact measurement, then use that piece to measure the rest. After I had all my pieces cut, I moved inside and cleared my work space. The next step is super simple. Put the plywood on the wall, use a small level to make sure it’s level and use your nail gun to nail it in place. I nailed it on both ends and once in the middle. For spacing, you can use a nickel, some credit cards, or just wing it! Once all of the shiplap was up, it did need another coat of paint. I was trying out different plants to see what I liked best. The above plant is fake. I’m still on the hunt for one that’s a bit bigger. 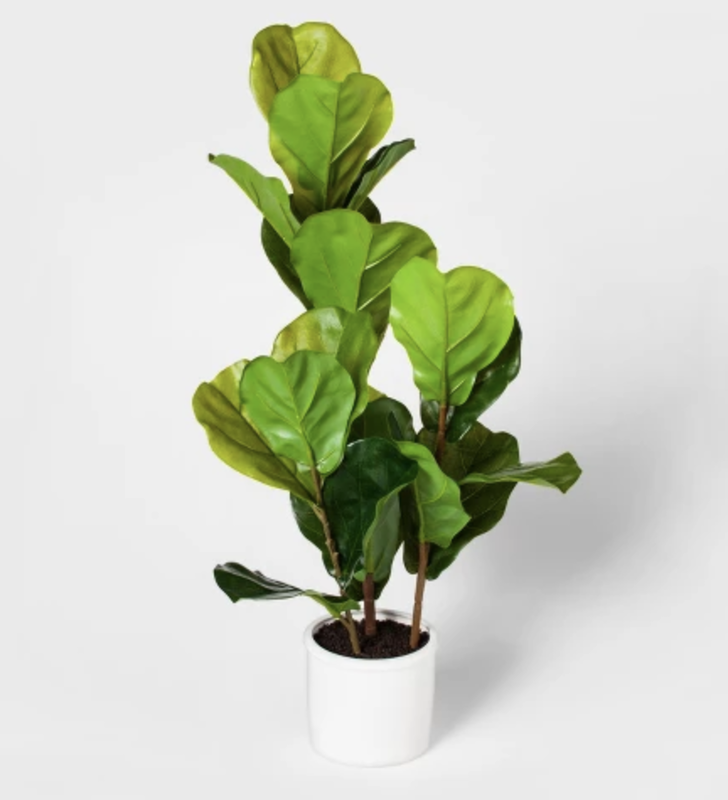 The plant below would be great for the area because it doesn’t need a ton of light. However, it’s a real plant and would potentially get dirt all over if it was knocked over. Want to know the best part about it? The way it lights up at night. I wish you could stand in my hallway and see it in person. This change makes the end of the hallway feel more open and brings so much character into the space. Don’t miss a thing! If you liked this post, you can get future posts sent right to your inbox, FOR FREE! All you need to do is enter you email below. Sign up with your email address to receive project updates, tips and more! Making a wood frame for your artwork. Kitchen update - cabinets and drawers oh my! Kitchen Update - My real thoughts and emotions behind this project. Traditional and non-traditional ways to decorate your walls. Tomato Cage Plant Stand: Repurpose a garden staple. House plants (and resources) for a beginner. How a no-mess activity for toddlers can be transformed into beautiful artwork for your walls. 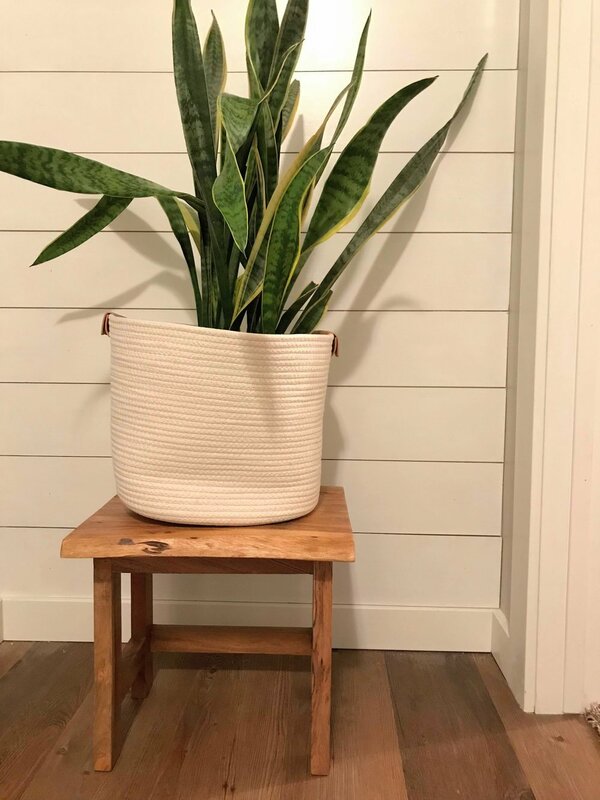 Board and batten entryway wall tutorial. Making your own engineering prints for your walls. A classic grey and white bedding combination. 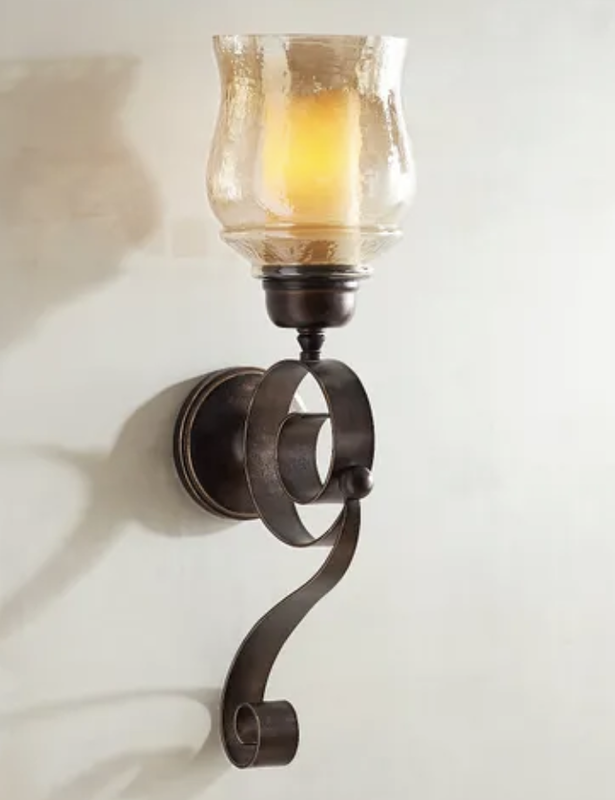 Older PostBoard and batten entryway wall tutorial. Sign up with your email address to receive project news, tips/ideas and more!